Guitar shows wear and tear not uncommon for a vintage instrument such as this. Luthier Notes: Guitar has had a neck reset, new frets installed, and a full setup upon arrival at Soundpure. Before arrival at our shop the following repairs were completed: Bridge is non-original and you can see where the old bridge sat on the top, it is in the correct location and intonating without issue right now. There were some cracks in the body that have been repaired and cleated and are stable after our inspection. The fingerboard extension was removed during a past neck reset (normal for the time), and the heel cap was broken and repaired during a past neck reset but is satisfactory after our inspection. This 000-28 is an instrument worth drooling over! Built in 1950 and certainly showing signs of its journey up until today, it has a tone and feel that is unmistakable and once you play it you’ll understand why so many players hunt for a guitar like this for their collection. We’ve got real vintage Brazilian Rosewood on the back and sides, and a Sitka top which gives you a bit more warmth in the midrange, but overall this guitar’s sound is round and subdued lending itself to a very intimate tone for your listeners. This is the real deal folks, while it may not look like something worth hanging on the wall once you strike a note you will have a captive audience and instrument made to be played and heard! 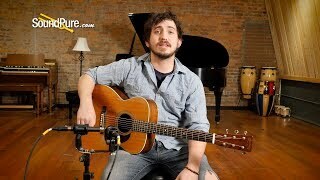 In this video, Sound Pure acoustics specialist Zak Jenkins demos a vintage Martin 1950 000-28 guitar. This Martin 000-28 has certainly seen a big chunk of history, but once you play it you’ll understand why so many players hunt for a guitar like this for their collection.